Felicia is a CEO, singer, songwriter, musician, gospel disc jockey, musical clinician, producer, and graphic designer. WMNZ Broadcasting Media Group's Website. Thanks for coming by! I'm sure you are wondering why we have upgraded our site after just 1 year? Well, we were so excited about the new things God is doing with this ministry, that we had to create a brand new site. Hopefully, this site will be simple and easier to navigate. You can find all of our ministries right here! Just one click will take you were you want to go. Each category has it's own link icon that you can click to go to the WMNZ site you are looking to visit. The Worship and Ministry Network Zeta Broadcasting's prayer is that something you read or hear on either of our sites, will bless and change lives through the ministry God has blessed us with. We hope your experience will be memorable and that you will come back to visit us soon. GET YOUR COPY ON ITUNES, GOOGLE PLAY, AMAZON, ETC. FOR ONLY .99 CENTS. THANK YOU IN ADVANCE FOR YOUR SUPPORT! From The WMNZ News Reel! New Release from WMNZ Music Group See More Below! Click on the Zeta Gospel Music & Radio Tab for rules and prize information. 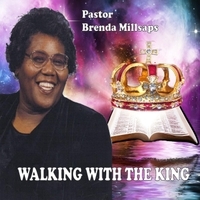 BUY YOUR COPY OF The New Single "Walking With The King"
After your payment is complete, you will be redirected to a download page. Please right click the player and save your file to the desired directory! Thank you for your support and we pray that you be blessed.